The revamped AR brand is the latest aboard the digital music player bandwagon: is the AR-M2 a worthwhile addition to the choice available, or merely a latecomer? The revitalised – or is that reinvented? – Acoustic Research brand is on a roll at the moment. We reviewed the AR-UA1 portable headphone amplifier/DAC with good but slightly mixed results, primarily due to some fits and starts with getting it working, and now we have its contender in the digital music player market, the new £900 AR-M2. Now you may have seen that price and instantly gulped, especially if you’re of the belief that there’s little point in spending good money on a dedicated music player when you already have a perfectly useable source of portable music in the form of a compact smartphone. If, however, your problem is more with any portable player carrying so exotic a price-tag, a spot of context may be needed. 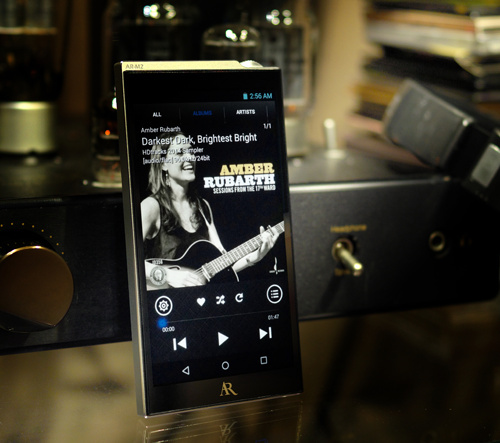 Yes, you can buy such a device for under £100, in the form of Fiio’s entry-level X1, but you could just as easily drop rather more – no less than £2999 – on Astell & Kern’s pro-audio-inspired AK380 flagship personal player. So while the new AR is undoubtedly in the premium sector of the market, it’s by no means pushing the limits of spending in this region – however many gasps it may induce, this is a pretty midrange model! Based around the technology of the company’s AR-M1, this latest version does away with that model’s unashamedly iPod-aping styling job, complete with small display and ‘wheel’ controls, and replaces it with a crisp, bright 5in 720x1280 HDIPS touchscreen display covering virtually the whole of the front face of the device, and powered by a fairly simple version of Android’s 4.3 OS. That opens up some intriguing possibilities as, with the built-in Wi-Fi capabilities of the player, you could actually browse a website while you are listening to music. Anyway, I’m getting distracted (as indeed I did while listening to the AR), so let’s get back to the main business in hand. The AR-M2 feels like a slightly chunky smartphone in the hand, weighing 245g and being some 15mm thick, with a knurled wheel to the top right to adjust volume, and hard buttons for power, play/pause and track skip functions down the right side panel, along with a sliding cover for the microSD card slot. The ‘transport’ keys are duplicated on the touchscreen display, which is slightly confusing, while along the lower face of the casework there are 3.5mm stereo sockets for line- and headphone-out, plus a microUSB socket for connection to a computer or the multiregion/multivoltage mains adapter/charger supplied. The M2 has 64GB of internal storage, which can be filled with music either via USB or by copying from a microSD card, and of course the storage can also be expanded using microSD. It’s also possible to play music from USB OTG (On The Go) compatible storage devices via the microUSB port, but of course this involves having a thumbdrive hanging off the M2, which is hardly pretty. The Android operating system also means the M2 can support apps for the likes of Spotify, Qobuz and Tidal (although no access to the Google Play store means you’ll have to install these as APK files, rather than doing it the easy way), but for optimal sound quality the player actually has two audio paths. The standard Android route handles app-sourced music, while for highresolution music from the internal or external storage, there’s an entirely dedicated path based around the preinstalled Music Player app, completely circumventing the less-than-impressive Android audio capabilities. Talking of that audio path, the AR will handle content up to 192kHz/24bit and DXD as well as DSD64 and DSD128, and does so using Burr-Brown PCM1794A DACs with dual clocks. There’s also an ALPS volume potentiometer in an analogue section which is claimed to be good for 2x40mW into 300ohm, or 2x240mW into 32ohm, figures which are borne out in PM’s lab testing. As he also notes, the heart of this player is the same as that of the AR-UA1 DAC from a couple of months back, although here the power source is an internal 4000mAh battery, said by AR to be good for up to nine hours’ continuous use. Having spent some time with the M2, that battery claim seems pretty accurate, although of course your mileage may vary according to the kind of headphones you use with the AR, and how loud you like to listen to your music. Not being a great fan of the kind of levels designed to pummel the brain into submission – I value my hearing rather more than that – I found the battery capacity more than adequate for all-day listening to everything from low-bitrate radio grabs right the way up to full-fat double-DSD recordings. As already mentioned, the battery is charged via the microUSB socket, but there’s one glaring omission here, which is doubly surprising given the state of the competition and the source of much of the audio design here: the M2 cannot be used as a headphone amp/DAC for a USB-connected computer, but is resolutely a player. That may either be a minor annoyance or a deal-breaker, depending on your point of view, but it’s hard not to see this as putting it at something of a disadvantage when even some rivals costing a quarter of the price do offer this facility. I guess it all comes down to how you want to use your pocket player: I must admit I tend not to listen to music on my computer too much when I am travelling – when does one ever have time? – and would be quite happy to use the AR as I currently use my compact and lightweight Fiio X3, which is purely as an alternative to the entertainment on offer on long flights. After all, I’m yet to find any airline offering a complete programme of BBC Radio 4’s Book Of The Week and other assorted podcasts stored up over several months of non-listening, so the Fiio it is! You get used to the chunky feel of the M2 – the weight can make it feel bigger than it is, though it’s still slab rather than sylph – but using it on the move isn’t all plain sailing. The weighting of some of the controls – mainly the side buttons – could do with some more heft, requiring more positive actions to operate them, since they fall just where the fingers do when you are gripping the player, and respond rather too readily. It’s a shame, as the volume control has good resistance, not only making it easy to set the level required, but also meaning it doesn’t get jogged when in the pocket, as the design suggests it might. That’s handy: the design language of players of this kind seems to dictate that volume controls should be overly obtrusive, requiring the casework to be arranged to protect them, but in this respect AR has got things just about right. However, it’s not perfect: I lost count of the number of times I turned the player up when I meant to turn it down – a volume control turning anticlockwise to increase level is almost wilfully counterintuitive. Add in the faffage involved in installing apps onto the player, and you have a piece of equipment in need of a serious dose of sonic fireworks if it’s to justify consideration, even apart from that ambitious price-tag. Fortunately the AR-M2 delivers on this count, not by sounding fl ashy or over-tailored but by offering a mature, well-considered and controlled sound. What’s more – and this will please the headbangers – the AR will certainly go loud, even with demanding headphones, and it will do so without showing any signs of distortion or compression. It simply refuses to run out of steam, even when crashing out the likes of Muse’s Drones set at very high levels. The remarkable clarity on offer here is maintained across a wide range of musical styles and headphone types, the latter in this case extending from the Oppo range to an exotic pair of Final Audio Design Heaven VII balanced armature in-ears. Whether with the Finals or the Oppo PM-3 closed-back headphones, the AR made a convincing case for itself as an ‘on the move’ listening option, sounding crisp, clean and dynamic with everything from rock to some intricate chamber music in DXD. I listened, for instance, to the Trondheim Soloists’ recording of Tchaikovsky’s Serenade for Strings, from Souvenir Pt I. Play some vintage Police tracks, from the Every Breath You Take singles package, and the snap and rhythmic drive of the AR is impressive on ‘Spirits In The Material World’, the open, dynamic sound making the most of the tight, clean production job, and bringing out the brooding atmosphere of ‘Invisible Sun’. However, there is a problem with the AR-M2, and it’s not to do with that lack of portable DAC capability, annoying though that will be for some. No, the main difficulty here is that this player faces such stiff competition from less expensive personal machines. Comparing it with my much used and somewhat battered Fiio X3, which currently sells for around £160 in MkII form, I found myself wondering whether I could justify the extra cost of the AR, and realising that the less expensive player was allowing me to enjoy the music nearly as much. Yes, the Acoustic Research AR-M2 sounds mighty impressive, is superbly built and offers wideranging hi-resolution compatibility, but I’m not sure it does enough to justify that lofty pricing. Based as it is on the same audio engine as the AR-UA1 DAC/headphone amp, it’s hardly surprising that the AR-M2 delivers a very convincing sonic performance, and has no trouble driving a wide range of headphones to extremely high levels. However, the intense competition from lower-priced rivals, not to mention the extra facilities they offer, makes it seem a little costly by comparison.